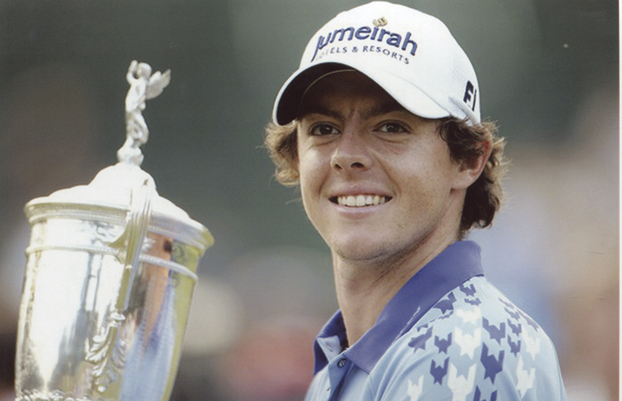 Rory McIlroy was named RTE’s Irish Sports Person of the Year at a televised ceremony in Dublin. The 22-year-old golfer from Holywood, Co. Down capped a memorable year by winning the U.S. Open just two months after he suffered a meltdown when leading the field into the last day of the Masters. McIlroy held off fellow Ulsterman (and British Open winner) Darren Clarke to take the prestigious RTE award. A week later both players were named on the Queen’s New Year list for Honours. When the list was announced, McIlroy was holidaying in Thailand with Caroline Wozniacki, his girlfriend and number one world tennis star. The Co. Down golfer said he was “delighted” to be named on the MBE honours’ list. Also shortlisted by RTE for their outstanding contribution to Irish sport last year were European boxing champion Katie Taylor, hurler Michael Fennelly, Gaelic footballer Alan Brogan, rugby player Sean O’Brien, boxer John Joe Nevin, cricket player Kevin O’Brien and footballer Robbie Keane. At the same ceremony, Republic of Ireland soccer manager Giovanni Trapattoni was named RTE Manager of the Year for 2011. His award was recognition for the 72-year-old Italian’s success in steering Ireland to the European Championships to be staged in Poland/Ukraine this summer. Despite being seeded third in a difficult qualifying group, Ireland made it through to the playoffs and beat Estonia 5-1 on aggregate to qualify for the finals of an international tournament for the first time in ten years. It was a fine achievement even if many Irish soccer fans remain dubious about the dour style of play demanded by the veteran boss. The Football Association of Ireland (FAI) endorsed the manager’s successful term by extending his contract for another two years. In a deal reputed to be worth €1.7 million a year, it will take Trapattoni up to the end of the qualifying games for the 2014 World Cup. The RTE Team of the Year award went to Heineken Cup-winning Leinster rugby team. Former rugby great Jackie Kyle, who was a key part of Ireland’s 1948 Grand Slam team, was also presented with a Hall of Fame award.